The Sketchbook Project has been traveling the country hitting large cities everywhere. Now it is in Orlando for two more days. I went on Friday, the first day to see what the buzz was about. I submitted a sketchbook and it is part of this national tour. In all there are over 10,000 sketchbooks from artists from around the world. The mobile sketchbook library is being housed at Full Sail Live which is a brand new state of the art performance space on the Full Sail campus. When I arrived, Mark Baratelli and Brian Feldman were in the lobby. The first order of business was to get a library card, so I got in line to pick up my card. Inside there are about 10 to 15 bookcases full of sketchbooks. My first impulse would be to thumb through multiple sketchbooks until I found one that caught my eye. Unfortunately you can't walk among the stacks and choose the books yourself. The Project staff have to find the sketchbook for you. You can pick sketchbooks by the artist's name or by geographic region or by the theme. I remember my theme was "Faces in a crowd." I asked for two sketchbooks with that theme. One had over rendered pencil drawings of people's faces from family photos. It had little appeal. The second book was covered in foil and had entire pages boldly painted with gouache. It was bold and interesting. Maisy and Ron Marrs showed up so I shadowed them for a bit so I could glance at Maisy's sketchbook. Her work was fun and whimsical and there was a sketch of me in there which was an unexpected surprise. I started sketching the long line of people waiting to check out sketchbooks. I spoke with Megan Everhart who was waiting to pick up her 2012 sketchbook. She had driven five hours down here from South Carolina to experience the Sketchbook Project first hand. Her work is abstract and she also does murals. Her iPhone had died so she couldn't continue to shoot photos. I offered her my charger but I couldn't find the wall plug piece. It was somewhere in my bag, but I couldn't locate it among all the art supplies. She had a five hour drive back north so she headed out early. A former Disney colleague, Rusty Stoll was checking out sketchbooks, but after four books he was disappointed in the lack of draftsmanship. I saw Tracy Burke with her parents checking out the work. I kept bumping into people I knew, like Bess Auer of "Central Florida Top 5." "This event was incredible!! If you missed it today, check out Sketchbook Project this weekend while you can!! "The Sketchbook Project was one of the best shows I've ever been to for art! International artists and their sketchbooks and the excitement of being able to share it with everyone!" 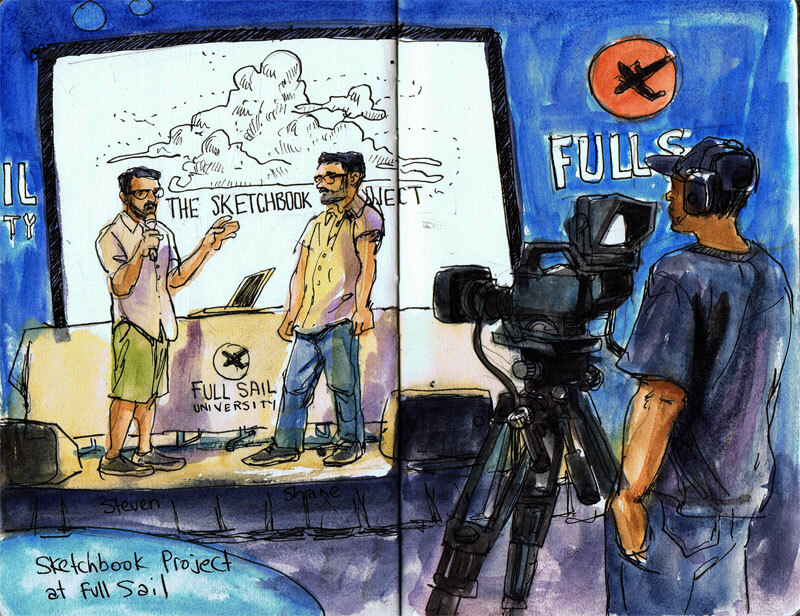 "Just got back from the 2011 Sketchbook project at Full Sail. It was awesome, so many books to look at. If you have a chance to go and check it this weekend Sat and Sun. 12-5pm. Check out Thomas Thorspecken, Peter Soutullo, Maisy Marrs and some other Florida Natives books while you are there. This is taking place here in Orlando, is free and its at Full Sail Live behind the Mickey D's on 436 and University." Hey Thor, has your sketchbook been digitized & posted on the Art CoOp web site? I'd love to see it. I sent my 2012 book in a few weeks ago and am still waiting on them to scan it. I didn't pay to have my book digitized. I digitized it myself before I sent it off. I'll try to get it up on AADW at some point. Oh, I met the girl who scans the books. It is a staff of 1 with 10,000 books. Ouch. I guess it might be a wait. I knew they had a small staff, but dang! I scanned mine, too, before I sent it in. I've posted a couple of pages on my blog and the Art CoOp Facebook page. Maybe I'll post a few more pages. say my name. I was a little star struck after reading your blog so much. I hope you do post it I would like to see it.